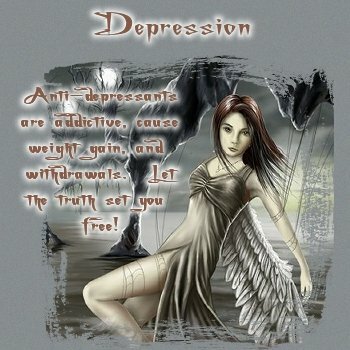 Depression - Symptom Not A Diagnosis! This is what the drug companies don't want you to know. They cause weight gain, are addictive, and cause withdrawals when you get off them! Also, they can cause or make worse hypothyroidism. On top of that, they can make your depression worse! The drug companies don't have proof that their drugs even work! In studies, sugar pills were more effective! These drugs slow down your metabolism so much that no matter how much you exercise and diet you will gain weight. SSRI's are addictive! These drugs are not a natural pill, they are addictive. Severe withdrawals are experienced when you get off these drugs lasting from 2 weeks to 2 months. Some even have less severe symptoms for months to up to 3 years after! Even missing one day's dose can cause withdrawals. Such severe withdrawals that cause many to lose their jobs, relationships, etc. You will be disabled for at least 2 weeks. I know from personal experience. I experienced two months of complete hell. I had sweating and the chills alternating, night sweats that woke me up, insomnia, daytime drowsniness and exhaustion, diarrhea, anxiety, headaches, severe & painful PMS, weight gain, memory problems, unable to concentrate, blurry vision, joint pain, dizziness, hypersensitivity to motion/sounds/smells, fainting, grinding of teeth during sleep, itchiness, nausea, heartburn, involuntary muscle twitching, numbness, and increased depression. Any side effects I had on the drug were magnified when I got off them. I tried many times over 14 years to get off these drugs. No doctor ever told me about these withdrawals, instead they said that was a sign that I needed to go back on these drugs. I finally found out the truth, so I am spreading the word so others don't have to suffer as long as I did! I wish someone had told me the truth 14 yrs ago! What a waste of my life! Spread the word, tell others! Don't let your doctor push these drugs on you! Everyone is now being told to go on these drugs for problems not even relating to depression! They are writing these prescriptions to get their patients out of the office quickly instead of taking time to find a diagnosis for the symptom! Unless you can't get out of bed and are suicidal, please don't take these drugs. If considering them, don't take them! Or at least educate yourself thru the links on this web site. Don't trust your doctor to inform you. If on them, get some time off work and get off them! This includes all SSRI's (Prozac, Effexor, Paxil, Zoloft, Wellbutrin, etc.) Effexor has the worst withdrawals. If you have depression, please look for a CAUSE of your depression. Often depression is a SYMPTOM not a diagnosis! Too often doctors hear "depression" and just write out a prescription for an antidepressant without looking for a CAUSE and correct diagnosis! Turns out my withdrawal symptoms that I still have after 7 months off the SSRI are symptoms of hypothyroidism. Depression being the symptom, hypothyroidism the diagnosis! 14 years on an antidepressant suffering with side effects and finally I find out the real reason for my depression! My doctor read my test results and said they were normal, NOT! I got the numbers myself and found out he was wrong! Get your blood test numbers yourself and compare them to this chart. Basically TSH - 0.3 to 3.0 (under .3 hyperthyroidism, over 3.0 hypothyroidism), T4 - 4.5 to 12.5, FT4 - 0.7 to 2.0, T3 - 80 to 220. Sadly, doctors make this mistake often! Anyone who has depression should have their thyroid tested EVERY year! A simple blood test done at your family doctor is all that is necessary. Even if your blood work comes back normal, if you have all the symptoms some doctors will prescribe the inexpensive pill "Synthroid". I went through years of misery due to this misdiagnosis at least 7 yrs, possibly 14-18 years! Common symptoms are but not limited to: fatigue (drowsiness), depression, feeling cold, constipation (or IBS), headache, PMS increased, weight gain, anxiety, memory problems, hair loss and dry hair, joint and muscle pain, and dry skin. Some say twitching eye lid, blurry vision and ear ringing also. Also postpartum depression can be caused by this and may be temporary. IBS (irritable bowel syndrome) is also often hypothyroidism. Remember often depression is a SYMPTOM and not a diagnosis! Depression can often be easily and quickly cured when you find out what is wrong with your body! Don't let your doctor push these antidepressants on you without looking at the rest of your symptoms! Don't be ignored and mistreated as I have been. Stand up for yourself. Find another doctor if yours wont listen! Unfortunately, everyone has to be their own doctor and only use their doctor for prescription writing. So research every drug you are prescribed and every symptom you have. Find your own diagnosis as I have. So you got your test results back from the doctor and the diagnosis is Hypothyroidism, what's next? It will take from six weeks to four months for you to feel better. You must test your thyroid every six weeks till you feel better and your test results come back normal. Medication increases can be done every six weeks. If you don't feel well insist on trying different drugs till you do. Too many doctors are undertreating hypothyroidism! They don't want to take the time necessary to find the correct medicine and the correct dose. Just having your test results come back normal isn't good enough. You have to feel better too! Most people are placed on a T4 drug like Synthroid. If your thyroid doesn't convert that T4 drug into T3 then you will need a T3 drug. There are two T3 drugs Cytomel which is synthetic and Armour which is natural. Once you have the correct dose and medication you'll have your thyroid tested in six months then every year. You need to take this medication for the rest of your life. Doseage levels will need to be changed from time to time. Diet restrictions: don't eat any raw (uncooked) cabbage, broccoli, rutabaga, cauliflower, kale, brussels sprouts, watercress, and peanuts. No soy products, milk, or kelp. Over the counter cough and cold remedies will often contain small amounts of iodine or stimulants (norepinephrine, neosynephrine, adrenaline etc) that may affect blood pressure and heart rate. No antacids. Health food supplements containing kelp or seaweed extracts may contain substantial amounts of iodine which may also precipitate or exacerbate thyroid disease in susceptible persons. Avoid St. John's Wort or antidepressants which will lower the effectiveness of your thyroid medicine. Recommended - good multivitamin will include proper levels of important trace materials, such as selenium (200 mcg daily) and zinc (20 mg daily). B100, Niacin, Inositol Hexonicotirate (Vitamin B-8) 2-10,000 mgs, Pyridoxal-5-phospate. Find the physical reason you have depresssion. Possibly - hypothyroidism or menopause to name just a few. State Medical Boards - check to see if your doctor has a license! Wishing you good health & happiness!